Above: 1984 - Indira Gandhi's handiwork. 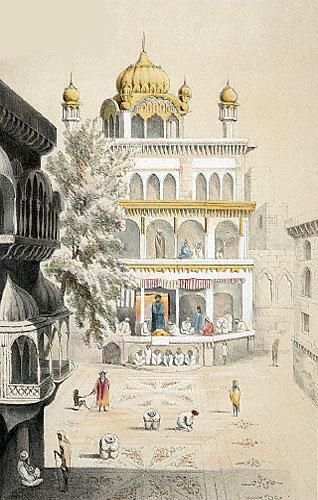 Below: first from bottom - The pre-1984 Akal Takht in a 19th Century sketch. Second from below - The new Akal Takht, post 1984. I was in the 8th grade. What did I know? I knew my father wasn't coming to my Junior High graduation. For me, that's what mattered at the time. It was June 6, 1984. It was the same night Peter Jennings came on the evening news and in a brief 30-second voice over, with an over-shoulder graphic of a burning building, reported about the storming of the Darbar Sahib. My parents were in disbelief. They were in complete mourning. They were engulfed by the news of a place I'd never even visited. All I knew was that it was halfway across the world. For the next several days, the transistor radio was tuned diligently to find any channel that would give some news of what was going on in Punjab. The TV news was on in hopes of catching some video or photographs of how severe the damage really was. The pictures came, slowly, over the years. But the image of the collapsed Akal Takht was clear as day. Something awful had happened. It would shape the future of my nation, my people, and me. The broken Akal Takht was just the beginning. Then the reports came of the 37 other Gurdwaras that were attacked simultaneously, to coincide with what happened in Amritsar. But even more was to come in Delhi later in the year. The coordination was stunning. Sikhs were burned alive, raped, hunted. While these were the visible terrors, the reports of Woodrose, the operation that went into full force after Operation Bluestar, would come trickling out years later. Those stories were even more horrifying. They demanded I become active and realize my own bond to the souls in Punjab. That's where my Gurus, taught, created cities, and began the Sikh revolution more than 500 years ago. It was burning again. Was it our era's second coming of Babur? But really, in 8th grade I didn't know what it had to do with me. For me, I remember the disappointment I felt that night. How childish that was, given that I now ache acutely every June as I remember in full force what should never be forgotten. That 8th grade disappointment is nothing compared to the sorrow, outrage and activism I now feel about that pivotal moment in modern Sikh history. I did make it to that place four years later. 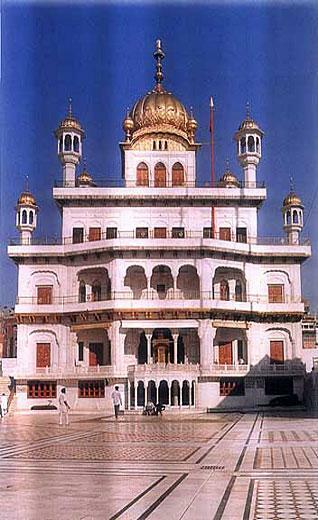 I walked the parkarma of the Darbar Sahib in December of 1988. This was the place that awakened a sorrow in my parents I didn't realize they could possess. The place still bore the marks of what had happened. But the worst damage had already been plastered shiny new and white. But there were still bullet holes, there were still broken marble columns and there was still a hush. My mother told us of the boisterousness of this holy place, but even in 1988, the quiet of the Darbar Sahib was not because of the sacredness of the place, but because the walls, the sky, Waheguru stood witness to what happened there. I felt it then. As I feel it again and again every time I return. While the crowds have returned and the Akal Takht is new and every one in India talks about forgetting and moving on, that sarovar reminds me of the tears that must have been shed over the centuries, and again after 1984, for the loss our nation has collectively endured. But now, I am part of that quilt of time and history. I have my own connection to the blood that flowed for no true reason against innocents. I'm not sure how to describe my growing understanding of the impact of 1984. It has matured over the years as I have grown and as more information regarding those fateful times comes to light. I have conducted countless seminars to teach young people of the importance of this modern history. There are still the detractors. Just like the Holocaust deniers. Their choir chants: "It must have been Bhindrawale's fault. He had weapons, he had women." The misinformation campaign has definitely captured a segment of the community. They are still in fervent denial of this government-sponsored attack, and the anti-Sikh pogroms of Delhi that followed a few months later. But what my mind comes back to is, how does a democracy do this to its people? Especially when you consider the sacrifices those from Punjab have given for the Indian Nation? These, most likely, are naïve questions. But, as a young person learning about what and who my people are, in an effort to understand my own identity, they were significant, because they are part of modern Sikh history. Moments that I will remember. Just like I'll never forget where I was on 9/11. I hear many in my generation and older say that they became stronger in their faith or claimed their faith because of the events of 1984. This was not the case for me. I always knew in the core of my heart that Sikhi meant something to me. This moment in history did not make or break my commitment to my faith. But there is no denying there are many who decided to keep their turbans and become more observant in their faith because of 1984. When I see the images of what happened on that day in June and read the reports, there is anger. I've seen the mutilated bodies, read actual court filings of the thousands of reported missing in Punjab. Those cases will probably never be truly solved. But I am also keenly aware, that we will overcome. Through all the pain, there will be the words of our Gurus to lift us above those who violate us. Having attacked Khurasan, Babur terrified Hindustan. But has sent the Mughal as the messenger of death. There was so much slaughter that the people screamed. Then its master must answer for it. And no one pays any attention to the dead. He is just a worm, for all the corn that he eats. It is Punjab that has sustained the subcontinent and will do so for ages to come. It is our glorious Gurus who have sown the seed of Chardi Kala for the people of Punjab. I believe that we will remain strong and rise up against tyranny and allow the truth to prevail. So, I'm not that upset 8th grader any more. 1984 wasn't about my Junior High Graduation. It is seared in my mind for a far more important reason. 1: I.J. Singh (New York, U.S.A.), April 03, 2009, 2:56 PM. Harvind, a touching story movingly rendered. This is the stuff history is made of and that we need to capture. 2: Saheb Singh (Montreal, Quebec, Canada), April 04, 2009, 2:15 PM. A really commendable feeling of your heart, which you have expressed so beautifully. It brought tears to my eyes. 3: Sharan Kaur (Elmhurst, Illinois, U.S.A.), April 06, 2009, 8:58 AM. A very well written article and how well put! 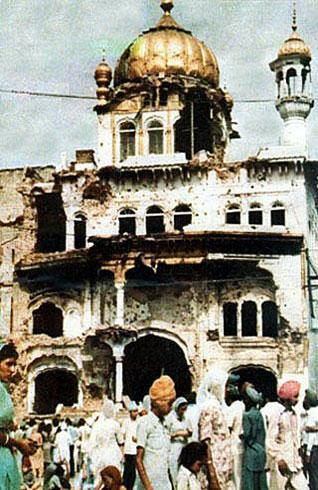 We all surely need to be reminded of how much sacrifice our fellow Sikhs made during this period and how horrible an attack this was not only on our beloved Harmandar Sahib and the gurdwaras all over India but also on all Sikhs as a whole. I pray that may justice someday be served. 4: Inni Kaur (Fairfield, CT, U.S.A.), April 06, 2009, 2:00 PM. Harvind, I too am part of that quilt of time and history. I too have my own connection to the blood - the blood of My People, that flowed for no true reason. Thank you for putting this in words. 5: Kuldip Singh Makker (Hoffman Estates, Illinois, U.S.A.), April 06, 2009, 6:45 PM. "INDIA ATTACKS GOLDEN TEMPLE!" Front page article in Chicago Tribune at Union Railway Station, Chicago, made me cut my thumb to write Ek Onkaar with my blood. Big procession with 'KHALISTAN ZINDABAD' slogans. Chicago Sikhs gave hundreds of thousands dollars to help the cause. A very sad day of my life. 6: Gur Singh (Bolingbrook, Illinois, U.S.A.), April 07, 2009, 4:44 AM. An unforgettable and painful happening which no Sikh can forget, has been refreshed. A timely reminder, lest we forget. In 1984, it was the first time I cried after my father's death in 1963. The Sikh psyche is altered for ever, at least for my generation. Thanks for the article. 7: Harbans Lal (Arlington, Texas, U.S.A.), August 17, 2009, 9:45 AM. Harvin Kaur is a budding Sikh youth with training from University of Chicago, who contribute widely to Sikh media. I like your column Harvin, and always support you. However, this time I have a legitimate issue to argue. Your English rendering of the Gurbani hymn known as Babar Vani is faulty because it is not consistent with Gurmat philosophy. You essentially implied that Guru Nanak blamed his anthropomorphic God for shirking to take the blame for the Mughal army as messenger of death. In Sikh parlance, God's Will or Hukam is rejoiced. Guru Arjan, Guru Tegh Bahadar, and numerous Sikhs accepted torture, suffering and finally martyrdom, but they did not complain to God. Rather, they felt content in God's will. Not one whined. Guru Nanak began his Japji on the first page of Guru Granth Sahib that teaches us to abide by Waheguru's Hukam. Then, how could he contradict himself later by depicting God as the one who had sent an army of messengers of death upon the people of the subcontinent. Similarly, he would not whine to God for not taking blame for the suffering through torture imposed by that attack. Thus, the prevalent translation of Guru Nanak's hymn on page 722 of Guru Granth Sahib is lacking and should be revisited. Actually, the hermeneutic treatment of this hymn would suggest that Guru Nanak was beholding Indian society for neglect of its value system that made them so helpless. Indian society, particularly Hindu societies, had become so damaged by their cunning clerics that they neglected their spiritual values and rich cultural heritage. They had succumbed to Brahmanism to the point that they could not face the Mughal onslaught described in this hymn. 8: G C Singh (USA), June 02, 2013, 6:54 AM. As per historian Harjinder Singh Dilgeer, the entire Operation Blue Star -- the attack on Harmandar Sahib -- was conducted by soldiers emboldened by alcohol. While the Indian army may have many other sources of procuring liquor, just the Punjab Government's excise and taxation department by an official notification sanctioned duty free, 700,000 bottles of Rum, 60,000 bottles of Brandy and 160,000 bottles of Beer specially for Operation Blue Star. Besides this, tens of thousands of cigarette packs were issued to soldiers who were freely smoking in the precincts of Darbar Sahib. 9: Baldev Singh (Bradford, United Kingdom), June 02, 2013, 7:43 AM. All this was about dirty Congress-Indira politics of 'Blood-for-Votes' nothing else. The Indian troops who were involved in the massacre were immediately rewarded with 142,000 quart bottles of whiskey!